Historian Chris Laursen takes a light-hearted look at the first haunted buildings he visited when he lived in Edmonton in his home province of Alberta, Canada in 1992. Fifteen years ago, I wrote my first ever article about the paranormal. At the time, I was a journalism student in Edmonton and was freelancing for the now-defunct arts and entertainment magazine the Edmonton Bullet. It wasn't the beginning of my interest in ghosts by any means, but it was the first time I had consciously stepped foot in places where ghostly things had allegedly occurred. I ended up interviewing Ron Hlady, a preservation technician at the historic and haunted downtown McKay Avenue School. The school is now a museum and archives run by the Edmonton Public School Board. 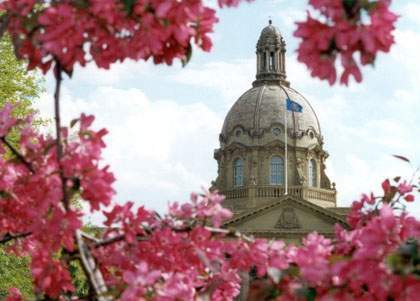 The building was actually the site of Alberta's first two legislative sessions in 1906 and 1907. The government rented the third floor assembly hall from the Protestant School Board for $400 per session, and it was in that room that politicians made the decision to make Edmonton Alberta's capital. After that, the young provincial government moved its sessions to cheaper digs until the current domed Legislature was built for it in 1911. At its peak, McKay Avenue School had 456 students in 1916, but that number declined steadily over time, leading to its closure in 1983 with only 53 students enrolled. 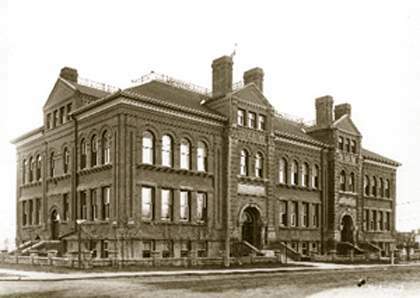 Its Romanesque design, pillared entrance and brick façade - all unique to Alberta architecture - prompted the school to be designated a Provincial Historic Resource in 1976, thus ensuring the building's survival in a rapidly expanding provincial capital where many of the old original buildings were torn down to make way for new development. Hlady told me about how objects mysteriously moved around and strange noises were heard at the school. In the late 1980s, Hlady and a co-worker were setting up chairs on the top floor of the building. They both left the room for a few minutes and returned to find the chairs scattered about, although no one else was in the building at the time. Hlady also recalled how lights had been turned on and off mysteriously, water taps have been found running when they should have been turned off, and the alarms in the building have been triggered without reasonable explanation. I recollect Hlady pulling a ouija board off a shelf in his office, and telling me that he had been experimenting with it, and communicating with a spirit who claimed to be a worker who had accidentally fallen off the roof of the building during its construction or a renovation. It is a well-known legend that this maintenance man is said to be one of the ghostly residents in the building, and I find it interesting that the legend may be rooted in Hlady's own ouija board sessions. I didn't mention this in the published article. Maybe it was just a figment of my imagination? Barbara Smith, author of Ghost Stories of Alberta, counted over a dozen spirits that are reputed to haunt the building. To this day, the McKay Avenue School is a prime destination for a local ghost walk. One of the buildings I looked into never made it into my published article. I cannot recall why I decided that it shouldn't be, but I remember very well visiting this rather unusual haunted location. I won't mention the name of this place, although I will say it was one of the last drive-in fast food restaurants in Edmonton, a small, somewhat cheesy but historical site all the same. (May the record show that I have fond memories of visiting this fast food chain as a kid, and having a tray of frosty glass mug of root beer, a freshly grilled hamburger with greasy but delicious onion rings attached to the window of my parents' car for me to enjoy. Oh how the times have changed. Mind you, I'm not so old to remember servers on rollerskates!) This particular restaurant no longer stands, a victim to Edmonton's development and a changing fast food industry. Trendy downtown condos now stand in its place. The employees had been reporting strange things. One day a fry cook was almost injured when the open lid of the fryer he was using slammed down. On several occasions, the combination safe in the office was found to have opened with no plausible explanation as to why. Everyone was talking about a ghost. They were a bit freaked out by this, but also fascinated. I can't remember getting much more detail beyond that, and maybe that's why it didn't make it into my published article. After my first foray into allegedly haunted buildings, I remember feeling rather disappointed. By that time, I had read several books on ghosts and marvelled at the famous photographs of the Brown Lady or Tulip Staircase monks, was astonished by the spontaneous appearances of the faces of Belmez, the Enfield poltergeist, and the many adventures had by professional ghost hunter Peter Underwood in his books. I guess I had expected to hear reports of half-body apparitions floating through the halls and disappearing through closed doors, of eerie messages being scratched into walls, or at least get to hear some ghostly footsteps. Someone had told me around that time that ghosts preferred wet and damp environments, which seemed to explain to me why rainy England was so haunted and arid Alberta was not. Edmonton, I concluded at the time, barely had any ghosts, and the ghosts it did seem to have - well, I very much questioned whether they were ghosts at all. The maintenance man falling from the roof and then haunting the building sounded too fanciful to me, like an urban legend. And I thought there were just too many possible natural explanations for why these reported things happened. In hindsight after reading a great deal about ghostly phenomenon, my view has shifted. I can say that the McKay Avenue School's domineering atmosphere made a definite impression on me. Now, when people tell me about a haunted school or institution, I think of its spacious rooms and tall windows that seem perfect for ghosts. And Ron Hlady was a very effective and kind guide who honestly felt there were probably spirits walking through the former school's halls. With further investigation, no doubt natural causes could resolve some the mysteries that have been experienced in these haunted buildings I visited. But reading updated remarks of those of have since visited McKay Avenue School, I can definitely respect that there is something odd there - a sense of something unseen yet present. The fast food restaurant may no longer stand (my Dad suggested perhaps the new condos are haunted in its absence), but McKay Avenue School sits waiting at the corner of 99th Avenue and 105th Street, waiting for open yet sceptical minds to explore its space. Barbara Smith's Ghost Stories of Alberta which includes an account of McKay Avenue School (1993), More Ghost Stories of Alberta (1997) and Even More Ghost Stories of Alberta (2001) all delve into the tales that come out of the province, proving my initial impression of Alberta being not all that haunted quite wrong. They are available from Lone Pine Publishing.